AMS' new intercooler gives your 135i/335i the edge over the competition. Your car's stock intercooler is a fraction of this size. Even with a stock vehicle, any time you step on the gas you are robbing yourself of horsepower, because your stock intercooler does not have the ability to cool enough air. It is running hot air into the engine bay, giving your twin turbo engine sluggish throttle response, acceleration and an increase in turbo lag. Warm or hot air has fewer molecules of oxygen per cubic centimeter then cool or cold air. Hot air leaves your engine out of breath and gasping for more oxygen. However in cold air the oxygen molecules are tightly packed together, giving an optimal mixture to create a powerful and complete combustion. This allows the engine to perform to its highest performance without ever losing power. It is proven on 1/4 mile times that an engine will perform and will make a better time when the weather is cold and dry compared to times when the weather is hot and humid. The AMS BMW 135/335 Front Mount Intercooler is the best performing direct bolt on you can buy. Simply by bolting on this intercooler on a stock car you can expect over 10 wheel horsepower gains. cars running increased boost due to a tune have seen 40 plus wheel horsepower near redline! This intercooler has over 49% more internal flow area than its stock counterpart, works with the stock piping and only requires small trimming to the plastic bumper support. 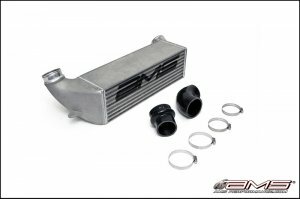 This AMS Intercooler features cast aluminum end tanks for added durability with smoother features and geometry. Designed by AMS' engineering team using Solid works (3D CAD software) these A356 T6 Alloy Aluminum end tanks have improved flow over sheet metal end tanks and include gusseted brackets to prevent cracking or failure. AMS end tanks don’t end there. They also incorporate an industry first 3” inlet and exit port. AMS goes beyond the competition to ensure quality. Each AMS Intercooler is hand TIG welded in a jig for a perfect fit and pressure tested to 50 psi to ensure maximum performance. AMS tested many intercooler cores to find the best performing units available. Over the past 8 years AMS has tested just about every core available to source the best manufacturer for their kits. BMW is no exception as this intercooler is manufactured by the same company that has 1400hp drag cars and time attack race team. Installing this state of the art AMS intercooler will ensure that you are constantly flowing cold crisp air into your engine bay; feeding your twin turbo charged engine oxygen enriched air that will give you that edge, of constant horsepower over the competition. No matter if your driving through the desert or at the track this AMS intercooler will surpass all your cooling and performance needs. Best performing intercooler on the market and requires less bumper support trimming than the competition. Custom molded silicone couplers to optimize airflow volume and velocity. Will bolt up to your stock piping or most aftermarket pipe kits that are designed for the stock intercooler. Silicone couplers designed to be used with stock and most aftermarket piping.